I have long been an admirer of the stunning bundt creations to be seen over at Dolly Bakes. Being averse to tins for storage reasons as well as sticking ones, I’ve been on the look out for a silicone bundt-type mould to use. I’ve not found anything suitable – until now that is. Lékué do an amazing range of silicone bakeware and it looks to be better quality than some I’ve come across. Recently I received a few items from them to try out. You can see how I got on with the bread maker in a previous post. The bundt-like mould they sent, however, was the very first thing I tried. I was a little nervous and quite excited. For my first ever bundt, I thought I’d create an orange and chocolate marbled affair with an orange glacé icing. There were no clues as to the quantities needed for the mould, so I had to guess. I thought I was making a generous amount of cake mix, but it barely covered the bottom. As it turned out, this was fine and produced a perfectly sized cake which still looked good. The second time I used it, I upped the quantities, but it still didn’t make a full size cake. I sprayed the mould with oil just to be on the safe side – I really didn’t want it getting stuck. I needn’t have worried, it came out like a dream. Despite my nerves, I was really happy with the result of my first ever bundt-shaped cake. It really looked quite striking. The almonds, orange juice and yogurt kept the cake nicely moist and the flavours were clear and fresh and worked beautifully in combination. The Lékué bundt-like mould was so easy to use too: it was sturdy enough to stand up in the oven on its own without losing shape; I had no problems turning the cake out (and the second time I didn’t spray it) and it was easy to wash. Perfect. I can see this getting a lot of use. A few days later, we had some good news to celebrate and invited some friends around for tea. So impressed was I with my orange and chocolate bundt-like cake, that I decided to make another one. Only this time I added more ingredients and accompanied it with a third flavour – matcha. This was an even prettier cake than the first. It was bigger and had three contrasting colours rather than two; once cut the interesting swirling patterns were revealed and some of the slices were spectacular. No one piece was the same. CT likened it to a metamorphic rock, maybe not marble but it was certainly very “gneiss”, he quipped. The cake was just as delicious as the first and the texture was equally good. Now what ingredients, I wonder, am I going to include in my third bundt-like cake? Not only are these bundts completely made from scratch but the recipes are my own. With just a little bit of pride, I am thus sending them off to Javelin Warrior for his Made with Love Mondays. As you can probably tell, I have a new found passion for bundt cakes, so I am sending these off to the very first Love Cake Challenge with Ness over at JibberJabberUK who has chosen the February theme of Baking with Passion. As already stated, I’ve rather fallen in love with these cakes, so although they weren’t made for Valentine’s Day as such I think they fit into the general love theme for February, so I’m sending this off to Dolly Bakes for her Calendar Cakes – Oh L’amour. CT is quite keen on these bundt cakes too, so it is possible the next flavour might be a mocha one and he might get it for a special Valentine’s Day treat. As such I am submitting these to Lets Cook Sweet Treats for Valentine with Nayna over at Simply Food. Both of these cakes were made for loved ones, so I am also entering it into the Four Seasons Food challenge with Anneli Delicieux and Lou at Eat Your Veg. The theme this month is not surprisingly Food From The Heart. Finally, I think, I’m linking this up to #recipeoftheweek with Emily over at A Mummy Too. Thanks to Lékué for sending me the bundt mould to try out. I was not required to write a positive review and as always all opinions are my own. A deliciously moist marble cake where you get two different flavours in one bite. Looks impressive too. 1. Cream butter and sugar together until light and fluffy.2. Beat in eggs, one at a time, alternating with a spoonful of the flour if necessary.3. Sift in the flour, almonds, baking powder and bicarb. Stir until just combined.4. Place half the mixture in a separate bowl.5. To one bowl, grate in the orange zest and 1 to 2 tbsp orange juice.6. Dissolve the cocoa powder in 2 tbsp warm water, then add to the other bowl along with the yogurt. Stir until just combined.7. Spoon heaps of alternating batter into a greased bundt mould or tin. Bake at 180°C for about 40 minutes or until the cake is well risen and an inserted skewer comes out clean. Allow to cool for 10 minutes, then turn out onto a wire rack to cool.8. Mix the icing sugar with just enough orange juice to make a slightly runny icing. Spoon or pipe this over the cooled cake. I was just saying, before I was rudely interrupted 😉 that when I used to use silicone pans back in the day, I always got weirdly shiny cakes! So sorry about the eaten comment Anna. The word verification thingie is such a pain – I often get my comments eaten up on other blogs so I know what it feels like. Sadly I am inundated with spam if I don’t use it. Haven’t noticed the weirdly shiny cake phenomenon and I use silicon a lot. As you say, it could be something to do with the make. My best cake mould is nearly 20 yrs old now, so can’t be to do with the age. Your Bundt looks beautiful! I’ve only ever baked one half size one and have a lovely tin sitting in the cupboard still waiting for its first outing. I’m interested in the silicone mould, I haven’t had the best of experiences with silicone so far but this sounds like it worked wonderfully! Thank you. I’ve been a fan of silicone moulds for many years – don’t know if it’s something to do with the quality of them or …? That looks absolutely wonderful. I have an old fashioned bund tin which sadly has only been used once – by my son! Thanks JW – it’s the sort of cake that impresses with its looks as well as its taste of course. Thank you Celia – I’ve always been a bit terrified of bundts. I love the colors and how the icing follows the contour of the cakes! Thank you Morgan, I was trying to make it as colourful as possible and was very pleased with the results. Both cakes look sensational! I love the swirled cake with the neat white icing drizzle, makes it look like a zebra. Stunning and fab flavours. Thanks Katie – neat icing is so much not my thing, so I was really pleased I managed it on this occasion. This cake looks delicious,thanks for sending it to lets cook for valentine event at simply.food. Thank you Nayna, you’re welcome. Those look so pretty and clever! 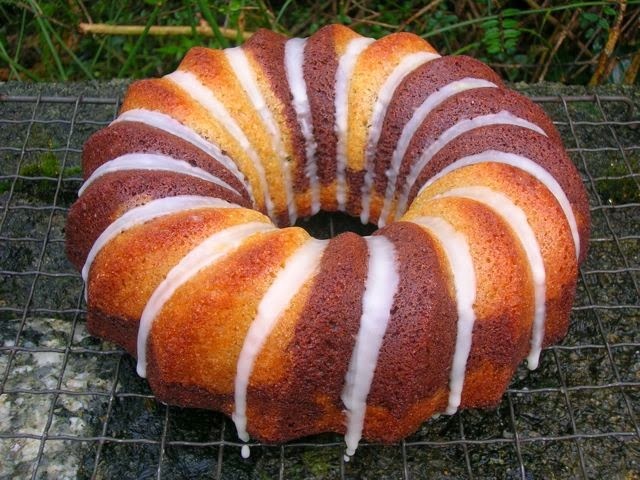 So, when we come to Cornwall, there will be a bundt waiting for us? That looks really great. Pork Belly has a traditional bundt tin just waiting for its first outing…. Ooh don’t leave it languishing in the cupboard Rosemary – think you’d better get onto Pork Belly straight away. Lovely looking cake – the icing is great as it accentuates the shape so well. Thanks CC, you can tell I liked it too as I used exactly the same technique the second time. Both bundt cakes look stunning with perfect swirls! This is a showstopper of a cake indeed! I adore the marbled effect with the three different colours/flavours. Simple and elegant! I have a bit of a ‘passion’ for bundt cakes as well hence my avatar! I’ve never used matcha powder but I think I’m going to have to check it out now. Thanks for linking up with the ‘Baking with passion’ theme for this month’s Love Cake. Thanks Ness – I’m a big fan of matcha as I find it works well in baking, both in terms of colour and flavour. Oh Choclette this is so so beautiful!! It looks really stunning and with no doubt very inviting. I have never made bundt cake. This is perfect if you have friends around or I would make it just as a treat to have with a good cup of English tea. Yummy! Looking utterly scrummy! Can’t wait to see your next generation Bundt! Thanks Emma – trouble is, it’s going to be hard to top this one I fear. Fantastic looking bundts Choclette, they look perfect. Love the swirly pattern in the matcha bundt. Thanks Jo – the joy of the matcha bundt in particular was that every piece was differently patterned. Did you know that this marbling striped effect is also known as a zebra cake – you could send this in to Alphabakes! I love the flavour combination. Haha, I didn’t know that. I did think of calling it a Zebra cake just for AlphaBakes, but thought that might be cheating. I have now made something for the Z now anyway which I’m also quite pleased with. I love bundt cake and yours looks stunning. I’m a big fan of both flavour combinations and the marbled colours are gorgeous. Just need to get hold of some matcha. How fab and delish looking. Can I please have some for tea? Thanks Sarah – sometimes the inspiration just flows! That is a beautiful bundt. I am also lost as to how much batter you need to make to fill tins. Some tins are labelled as a 8 cup bundt – which does not help in the slightest. Why now call them a 6 egg cake – it would give sightly more guidance – although I am aware that recipes vary. Thanks Helen. It would certainly be useful if the quantities were made clearer, but what I’ve found is that you can get a good looking bundt even if you only use a small amount of batter. Looks incredibly impressive to me Choclette! Good news on the Lékué cake mould, I’m going to start road-testing all my gear from them this week. Looking forward to it. Your recipe sound truly inspired too, with matcha! Thanks Lou – really enjoy using match in baking. Now looking forward to seeing what products you received and what you will do with them. That looks great, love the multi-colour effect. That is gorgeous! I really have to make it. Loving my bundy pan. Pinning this so I don’t forget! Thanks Nazima. I take it you didn’t get one with your Lekue bundle? It’s taken a long time, but I’ve finaly been won over by bundts. Thanks Deena, it’s nice to have a cake that looks interesting on the inside as well as the outside. Ah yes I saw these pics on Facebook – so pretty. Well done. This is stunning, what a showpiece and such gorgeous flavours. I wonder if I could use the same recipe in my mini Bundt moulds as they’re the only ones I’ve got? Thank you Katherine. I don’t see why you shouldn’t be able to use the recipe, but it would mean playing around with the quantities. You might find the first cake I made might be OK for quantity??? Thanks Jo, it’s taken a while but I think I’ve now become an outed bundt fan. I don’t remember Celia baking bundts, which shows how much attention I’ve been paying. My bundt mould didn’t have any clues as to quantity, cups or otherwise. Still, it’s quite fun making it up as I go along and so far so good! Oh there’s another thing I’ve never baked. You have made two stunning Bundts well done! Thanks Janice, there really just isn’t time in a single lifetime to try it all – more’s the pitty. Thanks Kirsty. It’s taken me a long time, but now I’ve actually got a bundt mould I think I’ll be making good use of it. I love bundt cakes and tins, but you’re right about the space they take up! I was lucky enough to be given a Nordicware one for my birthday and would love to start a collection but I have no idea where I would keep them all! Gosh yes, it’s hard to know where to keep all the baking paraphernalia, but bundts are rather impressive. Thank you, that’s very kind. Would love to hear from you if you ever do make it.